Hello, Friends. 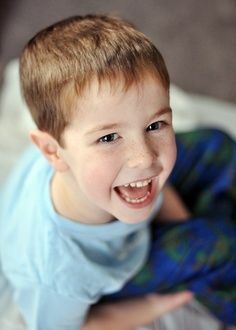 I am so long overdue on a post; I don’t even know where to begin. I’ve dined at new restaurants, read new books, traveled to some cool places and even cooked some a few new dishes. 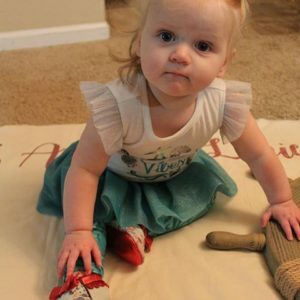 Most importantly, our sweet Alicia is 7 months old! 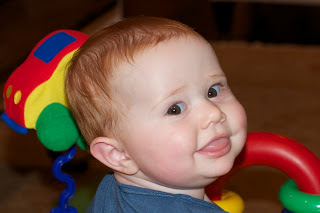 She is a reminder to me of how long it’s been since I’ve given this blog any TLC. Today I ate lunch at Café at Pharr and enjoyed delicious chicken salad that rivals Zoe’s. Yours truly loves a good chicken salad! I went to the Westside Location (on Chattahoochee) but they have multiple locations. I enjoyed the curry chicken salad served on a bed of greens with a yummy sesame dressing that’s also gluten free. All of the Café Pharr’s chicken salads are gluten free. I will definitely be going back again soon, as it’s very kid friendly and not crowded. Great service and our server knew what I was talking about the moment I mentioned celiac. Check them out at their Westside, Buckhead, Brookhaven, Vinings or Miami Circle locations. How did I not (re)discover Mellow Mushroom pizza earlier??? Of course I remember Mellow Mushroom from my college days in Charlottesville, sitting outside, after a long day of tailgating. Nothing went better with a pitcher of beer than a Mellow Mushroom pizza and pretzels. Mmm, just thinking about that crust and those late afternoons makes me miss college and my gluten-eating days. While I had read that Mellow Mushroom has a gluten-free pizza, I just hadn’t made it over there yet. What was I thinking? One Sunday afternoon, David and I decided to head over to the Mellow Mushroom on Peachtree Road and try out the GF pizza. Not only was the craving for pizza pulling us toward Peachtree’s Mellow Mushroom, but their flat screen TVs and the NFL Sunday Ticket. We’ve discovered our perfect spot for watching the Redskins when they’re not on the Atlanta networks. Mellow Mushroom was just the right place for an early Sunday dinner with four football games happening around us. 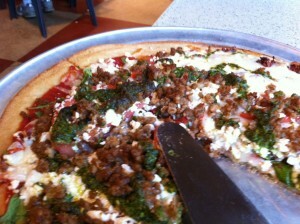 Kosmic Karma with sausage: so many toppings. I love it! Almost all of Mellow Mushroom’s toppings are gluten free, and our server was very knowledgeable as to which ones contained gluten. 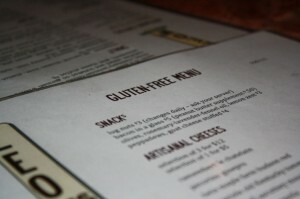 Unfortunately, Mellow Mushroom does not currently offer gluten-free beer on their menu but hopefully if more people request GF beer, they’ll add it to their beverage list. Will I be going back to Mellow Mushroom? Um, already have. Thanks, Mellow Mushroom, for making a delicious GF pizza that satisfies my carb and greasy food cravings! I’ll look forward to more Sunday afternoons with you. You can also call ahead and order takeout too. Another great option for an easy Sunday dinner! The Vinings location also sells gluten-free pizzas, if that’s closer to your neck of the woods. Note: I found that reheating the GF pizza worked best in the oven, not in the microwave. The pizza returns to its normal state in the oven, but is not so good in the microwave. Last week, my brother and his family came to ATL for a visit. 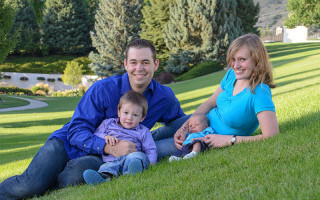 We had the best time showing off our city to Sarah, Tom, and my two nephews, Connor and Henry. Of course we shared many of our favorite restaurants with them too! Some of the highlights of the weekend included, homemade pancakes, Taqueria del Sol, Mellow Mushroom, Star Provisions, YEAH Burger, the Georgia Aquarium, and lots of playing outside. On Saturday night, my sweet friend, Michelle, offered to baby sit for Connor and Henry so we adults decided to have a night on the town. We took Sarah and Tom to Decatur to see a different part of the Atlanta area. After a drink at Iberian Pig, we headed over to one of our new favorite restaurants, Leon’s Full Service. Our waiters have always been well aware of the gluten-free options on the menu and I always feel like I have lots of choices. Even though the restaurant is always full of people, I get great attention from servers and I don’t feel rushed to make my decision. On our most recent visit, however, we learned that the folks at Leon’s have now made a gluten-free menu for their customers. Now I have even more reason to go to Leon’s! It’s a good thing we don’t live closer to Leon’s because I would eat there all time! If you haven’t been yet, you must go to Leon’s. The menu has both casual/light fare as well as fancier entrees. And they highlight seasonal, fresh ingredients from local farms. Gotta love that! Oh, and make sure to hang out at the bar before you get seated. The mixologists at the bar are fabulous and they create all kinds of seasonal beverages. 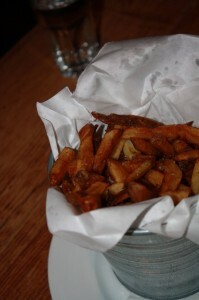 *The menu changes seasonally so expect to find new items when you go (except, of course, the fries). Recently I had the opportunity, through the Atlanta Gluten-Free Dinner Club, to sample some of Gigi’s Cupcakes’ gluten-free treats. 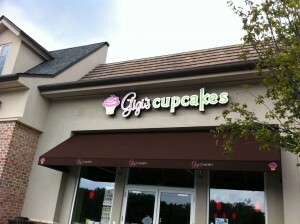 The Gigi’s at the Forum, in Norcross, makes gluten-free cupcakes every Tuesday and Thursday. On those days they always have chocolate cupcakes with chocolate frosting, vanilla cake with vanilla frosting and spice with cream cheese frosting. Delicious! 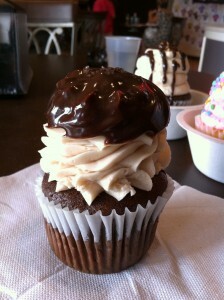 While Gigi’s is not a dedicated gluten-free bakery, they use precaution to avoid contamination. In fact, on Tuesdays and Thursdays they start baking early so to prepare the GF cupcakes before they make their glutenous cupcakes. 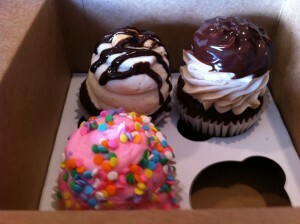 Gigi’s cupcakes are a sweet tooth’s dream! Amazing icing and delicious cake. 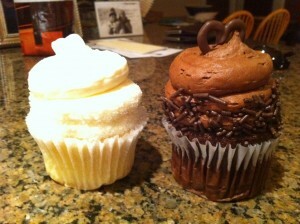 I know that cupcakes are trendy right now but I do think they’re so much more fun than cake. 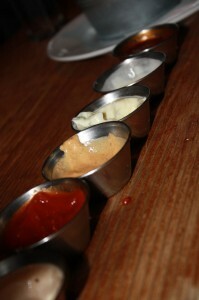 For indecisive people like me, you can try multiple varieties! PS: When we got married 7 years ago (!!!!!!!) we had cupcakes, instead of wedding cake. I guess we were way ahead of the trend! 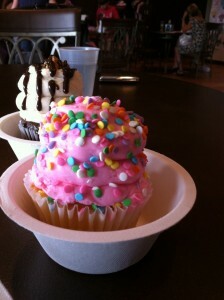 So cupcakes always have a special place in my heart. 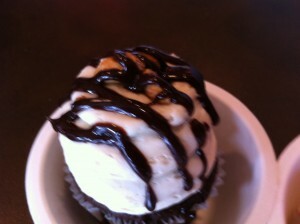 Not every Gigi’s makes gluten-free cupcakes but if there’s one in your area, I suggest calling and seeing if they do. If they don’t, you should highly suggest it. Of course they will need to take precaution when making them in order to avoid contamination. There’s always room for dessert! David and I love Indian food. We really love Indian food. Until recently, we had not yet found a good Indian restaurant in Atlanta that I confidently felt could ensure a safely gluten-free meal for me. Much Indian food should be naturally GF, as it’s centered around rice and yummy (flour-free) sauces but sometimes there can be a language barrier, which can make it difficult to be completely clear on what’s gluten-free and what’s not. Upon recommendations from friends, David and I decided to try out Bhojanic, a Decatur Indian restaurant, for our belated Valentine’s date. I emailed with the manager earlier in the week and they assured me that many of their items are gluten-free. 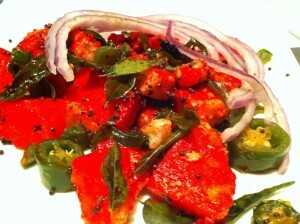 Bhojanic is located in a strip mall on Claremont Road (just off of I-85), not downtown Decatur. It’s very easy to get to and parking is hassle free, unlike downtown Decatur. We ended up ordering a handful of different items on the menu, but our meal centered around Chicken Tikka Masala, which is hands down my favorite Indian dish. At each restaurant, tikka masala is a little different, so you never know exactly what you’re going to get, but it’s a tomato based sauce that is delicious, and varying in spice levels. At bhojanic, you can order different sizes of this dish but David and I wanted enough for two (and leftovers) so we got the bigger serving. 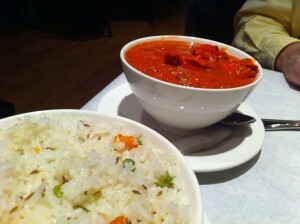 We also ordered a rice bowl to share with our tikka masala. The tikka masala had a bit of a kick to it, and was one of the best we’ve ever eaten and the leftovers the next day were equally as delicious. 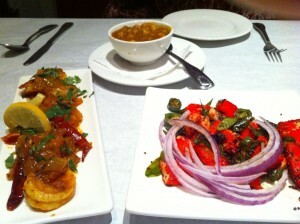 Everything we ordered at bhojanic was gluten-free so we could share all of our dishes. It’s so much more fun when you can happily stick your fork in your date’s food and take a bite, without worry. At this point, I don’t fully remember what we ordered (apologies!) but it was all delicious. 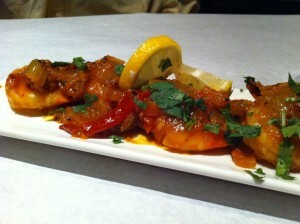 We enjoyed a chickpea side dish, a tapas dish that involved shrimp, and a cheese appetizer. Bhojanic has a long list of specials each night so the menu online is not comprehensive and most of the items we ordered aren’t even on it. Hence, I can’t tell you exactly what we ate, but you can see the photos. Yummy cheese dish: Beware, those are jalepenos, not okra, like I originally thought. I would definitely recommend bhojanic, but you want to make sure to check with your server or the manager about each specific dish. Also, they do not use a separate fryer so I would avoid anything fried. A successful Valtentine’s date night and David’s already advocating that we go back! Next time, I’ll remember what I ate. Well-known Atlanta restaurant, Canoe, is a place that I have gone multiple times for lunch and dinner, but I haven’t yet gotten around to writing about it. I was reminded of my negligence last weekend when I went to Canoe with David for a work dinner and easily made selections on their menu that could be tweaked to be gluten-free. Canoe is properly named, as it is located right on the bank of the Chattahoochee River, and was completely flooded during the fall of 2009. The atmosphere is calm, yet swanky and it’s not so loud that you can’t talk to your dinner companions. While you won’t feel like you’re in the middle of the trendiest scene in Atlanta, you will enjoy delicious food and good atmosphere. Canoe’s menu is expansive and doesn’t change often, so you know what you’re walking into. Many fancy restaurants have minimal items on their menu, which can be tricky for those of us that are already limited in our options. When inquiring with my server at Canoe, they have always said, pick what you want, and we’ll try to make it work. 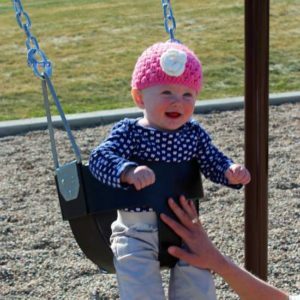 I love that attitude! My favorite items on Canoe’s menu include their Warm Artisan Cheese Salad with bacon, spinach, and dried cranberries. This starter definitely fits my love for sweet and salty dishes. The warmed cheese perfectly combines with the other items on the plate. Bacon, cranberries, cheese and pecans = YUM. For entrees, I love their sage roasted pheasant (without the crispy pheasant croquette). The pureed sweet potatoes that accompany this dish are delicious, and bring out the sweeter side of the sweet potato. (I consider myself to be a bit of a sweet potato snob and I love them!) The pheasant’s crispy, salty skin and tender meat are a great combination when mixed with the sweet potatoes or eaten separately. I’ve also enjoyed the salmon with spaghetti squash and spinach, for a healthier dish. Both of these entrees are light, yet filling. You don’t leave dinner feeling like you’ve overdone your evening out. 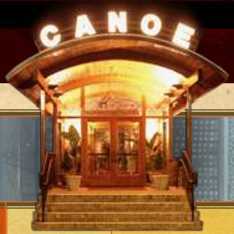 I definitely recommend checking out Canoe if you’re looking for a nice meal in Buckhead. There’s something on the menu for everyone and you won’t be disappointed! Have you been to Canoe? What are your favorite dishes? I love Mexican food, in fact it’s one of my favorite genres of food. It can be tricky to find good, Mexican cuisine that is safely gluten-free, as there are often language barriers and risks of contamination. When we lived near Washington, D.C., I was lucky enough to find two Mexican places I loved: Tortilla Coast and Rosa Mexicano. Much to my excitement, when we moved to Atlanta, I discovered that there’s a Rosa Mexicano in Atlantic Station, just a few miles from us. David and I went to the Atlanta Rosa Mexicano last weekend and were just as pleased with our meal here as back in the District. A word of warning: Rosa Mexicano is not your cheap, order by number, Mexican food. 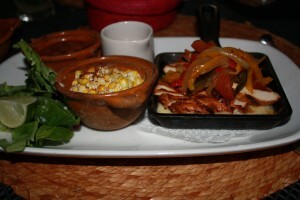 Rosa Mexicano’s food is high-quality, with fresh, natural ingredients. Not only does Rosa Mexicano serve great food, but they are gluten-free friendly, as they use corn tortillas and they fry their tortilla chips in a fryer that’s free from gluten. If you check out Rosa Mexicano’s website, they even have a gluten-free menu. The Atlantic Station restaurant didn’t actually have copies of the GF menu, but having perused the online version earlier, I had an idea of my GF options and what I wanted to order. When going to Rosa Mexicano, or any restaurant, make sure that you double check with the chef about what’s gluten-free, even if they have a gluten-free menu. Our waiter was very friendly and willing to run back and forth to the kitchen for us. He double checked everything for us. 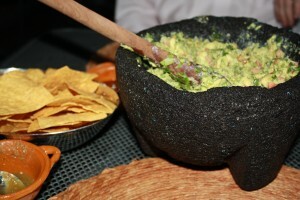 If you go to Rosa Mexicano, you must get the guacamole that they prepare table side. It’s so good, I want to lick the bowl. 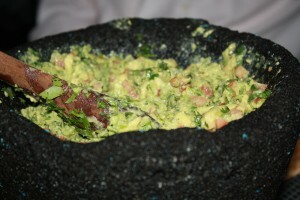 Every last bit of guac gets scraped out of the dish’s crevices. 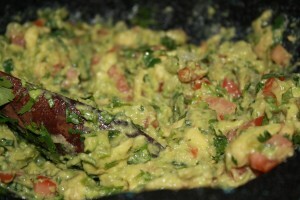 Their guacamole’s amazing, fresh, and you know exactly what’s in it because you see them make it. (A celiac’s dream!) As I mentioned before, the chips are gluten-free as are the tortillas so I can dip away! David’s a competitive eater when it comes to guac, so I just have to make sure I eat quickly and/or hoard some of the avocado-goodness on my plate. Normally I take my time when I eat, but it’s hard to maintain any manners when the guacamole is put on the table. Every man (and woman) is left to fend for himself (herself). 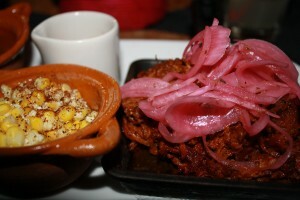 For my entrée, I usually go with one of the versions of the Tacos al asador: pork, steak or chicken. These are actually more like fajitas than what I think of as tacos, and I love ‘building my own’ from the platter of meat, veggies, beans and rice. On our most recent visit, David and I each got one order of tacos and shared. I love being able to share at a restaurant! David ordered the pork and I chose the chicken. I don’t usually order chicken at restaurants, but Rosa Mexicano’s chicken tacos are delicious and I particularly look forward to the cheese, onions and peppers that are cooked with the chicken. These dishes come with unlimited corn tortillas, and the black beans are speckled with cheese. David and I splurged that night by ordering two entrees, but in the past we’ve just ordered the guacamole and one order of tacos, and it was plenty of food for the two of us. If you’re craving Mexican food and want a restaurant safe from gluten, you should definitely check out one of Rosa Mexicano’s locations in Atlanta, DC, Miami, L.A., or New York. While the food’s a little pricier than most Mexican establishments, it’s worth the splurge. Recently, David and I wanted to enjoy the spring weather so we decided to head to Decatur, wander around, and get a drink. We had no plans of dining out, thinking that we would just eat a later dinner when we got home. We stopped at the Iberian Pig, a relatively new restaurant in Decatur, and grabbed a seat at the bar. This modern, Spanish restaurant offers many options on its menu, including cured meats, cheeses, small plates as well as entrees. We placed ourselves directly in front of a fancy meat slicer that managed to grab our attention. The bartenders were very attentive, and the vibe at the bar was professional, yet quirky. All bartenders wear white button downs, black vests and ties, yet I think it’s a requirement that you must also have multiple tattoos and piercings to work at the bar. I ordered a glass of Pinot from their relatively large wine selection. David decided to try an Old Fashioned, in honor of Don Draper from our new favorite show, ‘Mad Men.’ (Well, it’s tied for first with ‘The Wire.’) After sitting at the bar for a few minutes, we knew we liked the Iberian Pig simply because of the atmosphere and the Old Fashioned made by the bartender. 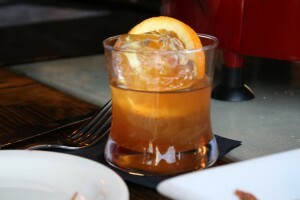 Who knew an Old Fashioned comes with one huge ice cube? Of course I took a look at the menu even though food wasn’t part of the plan. 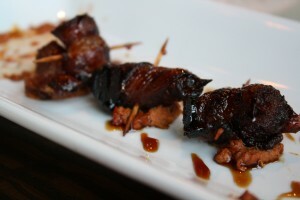 I immediately saw the “BWDs,” bacon wrapped dates stuffed with Manchego cheese and walnuts. Wow. Sounded potentially gluten-free, so figured it couldn’t hurt to ask. The bartender said Iberian Pig actually was making a GF menu so he called over the owner, Frederico Castellucci. He was very eager to serve us and went through some of our options with us while another waitress brought us the gluten-free menu. Much to my happiness, the BWDs are naturally gluten-free so we placed an order. These bites of tastiness were a perfect treat. As you know, I love the dates and cheese combination, and bacon makes everything taste better, right? 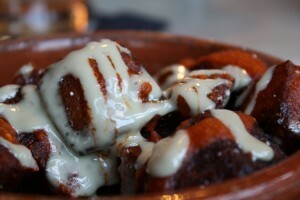 We also ordered the Patatas al Valdeon, crunchy potatoes with an aioli sauce. 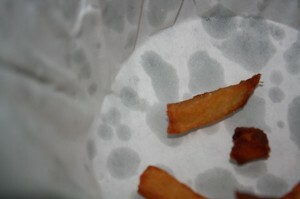 They blanch, bake and then fry the potatoes but they use a fryer that doesn’t fry breaded items. (I would still double check with your waiter when you go because they could change fryers.) These crunchy morsels of goodness were amazing and for once, I actually felt like I could eat ‘bar food.’ No salads or sauteed vegetables for this girl! The sauce went perfectly with the potatoes but didn’t sog them up too much. David generously let me enjoy way more than half my share. The menu lists where they get all of their meat from so you know what you’re ordering. It’s busy on a Friday night but you can still hear the person sitting next to you. We got great attention for the servers, bartender, and even the owner. The cool meat slicer is fascinating. It was such a great surprise to stumble upon a restaurant that was eager to accommodate and even had a prepared gluten-free menu. Celiac makes me have to be such a planner, so it’s always a relief when I can just happen upon a meal, and not have to think about what I’m doing or where I’m going far in advance. 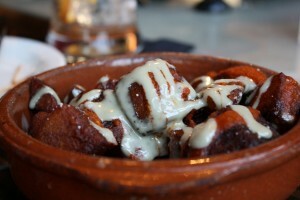 The Iberian Pig is definitely worth the trip to Decatur, even just for cocktails and appetizers. They have outside seating as well so enjoy a nice spring evening on their patio. I think I prefer the bar though. Last Monday night David and I went to 5 Seasons Brewing Company, Westside location, to sample their new gluten-free beer. While I generally prefer wine, it’s so great that a restaurant is serving a house-brewed GF beer. First, I must provide the disclaimer that I don’t know anything about beer tasting, but this particular beer brought back memories of Blue Moon beer for me, as it’s lighter and more of a citrus flavor. Crawford Moran, the beer guy at 5 Seasons, told me that he made this GF beer from sorghum and roasted buckwheat. He used gluten-free yeast and Cascade hops (whatever that is). Crawford described it as a very hoppy gluten-free beer. While I’m not a beer expert, I do know that to be a gluten-free diner and be able to purchase an alcoholic beverage under $5 is a rarity and a treat for my wallet. Wine tends to hike up the check when going out to dinner! I’m already looking forward to watching March Madness at 5 Seasons, while enjoying a cold, g-f beer and a slice of pizza. 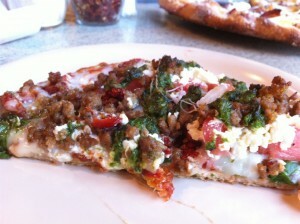 Check out their GF pizza with andouille pork, sausage, asparagus, onions and tomatoes below. Yum. As I mentioned last week, all of the specials on Monday nights at 5 Seasons are gluten-free, even their pizza special. They use a housemade pizza crust and 5 Season’s topping selection is always unique. This Monday’s special pizza was ‘Roasted duck, eggplant puree, spinach, red onions, cashews and tomato.’ Yum! I wasn’t in the mood for pizza this week since I’d just made pizza (pear, goat cheese, and sautéed onions…yum!) at my friend, Jen’s, on Friday night. I ordered the Braised Red Angus Beef ‘Little Plate’ (with carrot salsa and cheddar grits) and a side of brussel sprouts. Delicious and plenty of food for me. I just can’t seem to get enough Brussels sprouts this year. Other items on the ‘specials’ menu that looked yummy were the Duck Tostada and GA Pork Loin with organic greens, caramelized apples and smoked tomatoes. The daily vegetable plate is always a personal favorite for me. 5 Seasons gluten-free beer is officially on tap, but does not yet have a name. Can you think of a catchy/thoughtful/clever label for this brand new brew? Post a comment with your thoughts. Ok, so I’m never going to be able to eat at Ormsby’s, but I love the atmosphere of this new Westside tavern. I literally don’t think there’s anything on the menu I can eat except the peanuts and rosemary popcorn, and perhaps a burger patty, hold the bun. This tucked away bar in the White Provisions development that opened right before Christmas, is known for its beer, but I must say, that it’s also got a great wine selection. They do not yet have any gluten-free beers, but Ormsby’s wines by the glass are well priced, with a large selection. (Sure, it feels a little funny to not be getting a beer at a place intended for beer drinkers, but we celiacs are used to feeling a bit out of place at breweries and taverns.) My wine preference here is the $8.50 glass of Grayson Cabernet Sauvignon. The biggest difficulty is finding Ormsby’s as it’s basically in the basement of the building. If you park in the garage behind West Egg, and walk towards White Provisions, there’s a big wooden door with a small sign saying Ormsby’s. On a Saturday night, it’s not as difficult to find as this quickly popular spot will have a long line of folks waiting to get through the door. It isn’t just the booze that makes Ormsby’s a great place to meet up with friends, watch a game or celebrate a birthday. Downstairs they have a variety of games to entertain, such as bocce ball, shuffleboard and darts. We went to Ormsby’s one of the first nights it was open and had a great time playing the games. Now that Ormsby’s has been ‘discovered,’ you should definitely plan on waiting awhile for a game on a Saturday night. Weekday nights or a weekend afternoon might be your better bet if trying to get in on the game action. David and I went a few weekends ago to watch the Duke/Georgetown basketball game. (We don’t have television so during basketball season, we spend more money going out to watch games than an actual cable bill would cost.) As Duke was getting frustratingly clobbered, David and I noticed Ormsby’s also has board games. Love it! We pulled out Scrabble and brought it over to the bar. I proceeded to crush David at Scrabble, as witnessed by our friend John Jones, making me victorious in at least something that day, since my Dukies couldn’t pull off the ‘W’. Ormsby’s will continue to be one of our ‘go to’ Westside neighborhood spots due to its great atmosphere and the entire place is non-smoking. Ormsby’s has enough TVs so you can watch your favorite game (they’ll even change the channel for you), but the televisions don’t overtake the place like some sports bars. The wine list is pretty expansive, not limited to ‘house red wine’ like many beer spots. As I mentioned earlier, gluten dominates the menu, so if you’re looking for a gluten-free dinner, try somewhere else in the neighborhood for dinner, then venture to Ormsby’s for a glass of wine, boiled peanuts and a game of bocce.